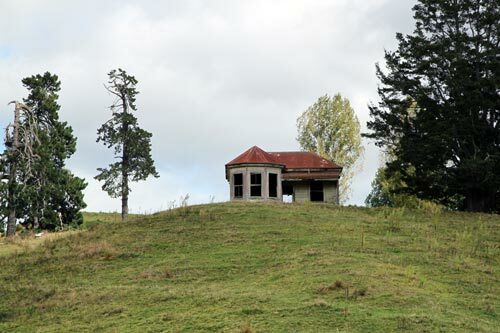 There are abandoned farmhouses throughout the King Country, including this one above State Highway 3 just north of Te Kūiti. These empty dwellings may speak of economic and farming challenges, but they could equally represent success or simply pragmatism, as farmers built new, more modern homes and stored hay or farming equipment in the old farmstead. This house is quite open – farm animals probably shelter in it when they are grazed in the paddock.